It might seem odd that a review of a wine preservation system would find its way onto an blog devoted to multisport performance for older athletes, but the connection actually makes a lot of sense. The reason is that serious triathlon and multisport is not exactly an obsession of the masses. It tends to attract upper middle-class athletes (who else can afford the carbon fiber bike equipment). And this same crowd tends to appreciate some of the other finer things in life– like good food and great wine. Here’s a really cool device for balancing an older athlete’s refined gastronomical hedonism with serious athletic performance. I love wine. There, I said it. In fact, I used to co-chair the Food and Wine Committee at a club I belonged to in Washington, DC and was even inducted as a Chevalier in the Chaines des Rotisseurs. When I was younger, it was easy to balance an appreciation of great wine with intense running and cycling– just jump in with both feet and do both intensely! In the wine department, I’ve got something of a weird ability to recall a larger than normal number of wines. After running the wine spectrum, my tastes ultimately settled on Burgundies and dry rieslings. Really well-made California chardonnays also make my cut. This probably has more to do with what the kind of animal proteins I eat– salmon and other oily fish and not red meat. If I were more of a traditional carnivore then maybe I could learn to love the intense syrahs and cabernet sauvignons that Washington state is known for. Unfortunately, a love of great wines isn’t exactly consistent with serious multisport for the older athlete. Ask anyone (athlete or non-athlete) and almost anyone will tell you that your ability to consume alcohol diminishes as we get older. Just one glass of wine can leave a serious older athlete with a headache and a sleepless night. One glass of wine has a noticeable effect on my athletic performance, which is pretty obvious in this age of power meters– I’m usually down at least ten watts the next day. In fact, during race season, I won’t even go near alcohol in even the smallest quantity. But it isn’t good to live in denial of life’s essential pleasures forever. So, a small sip of wine a few times a week in the off-season is a great way to remind ourselves of the essential pleasures that our non-athletic friends enjoy. I find that if I keep my intake below 3-4 ounces (a typical glass is 6 ounces, which is about 1/6 of a bottle), I’m absolutely fine for power the next day. At my extremely modest level of wine consumption during training, however, it would take me 9-12 days to finish a single bottle of wine. The problem, of course, with wine is that it goes bad quickly once opened. If you get the slightest bit of oxygen in a wine bottle, a weird chemical reaction takes place. In the short-term (a few hours), the transformation can be magical as a bottle of wine blossoms. But any longer than that and the wine goes downhill. After 12 hours, it’s noticeably worse than when it was opened. After a day, it’s usually astringent and unpleasant. After two days, it’s a wreck. There are a million different ways to try to preserve an open bottle of wine (vacuum seals, nitrogen sprays, etc) but none of them work more than a week. That’s where the Coravin comes in. It’s designed by an MIT scientist who was developing surgical equipment that could be penetrate human tissue without damage. He was also a wine geek and applied that same strategy to the problem of wine preservation. The system he came up with allows you to take as much or as little wine from a bottle without ever pulling the cork. Instead, a thin teflon coated needle penetrates the cork and pure argon (a chemically neutral noble gas) is pumped inside the bottle at the pull of a trigger– the wine then comes out a tiny nozzle when the trigger is released. Once you have accessed the quantity of wine that you need, you simply pull out the needle and the cork reseals itself. I have been using the Coravin for a few weeks now and, even with the most delicate wines, there isn’t any discernible taste difference between a new bottle and one that was accessed several times over the last few weeks. I can tell that the seal is intact because I impart a positive pressure when extracting the cork– and that pressure gets released whenever I insert the needle. The Volnay (pinot noir) and the eight year-old Stony Hill chardonnay in the photo above are down a fair amount (the Volnay is below a half bottle) and they are both in absolutely perfect condition– normally, they would fall to pieces in less than 12 hours. From my earlier days at wine preservation, I found that keeping things as sterile as possible also seemed to help wine from going downhill. If oxygen is the main enemy of wine, germs have to be the second. With that in mind, here’s how I use the Coravin. First, I make sure to sterilize the needle and the cork. To sterilize the needle, I just take some 100 proof unflavored vodka and wiped the outside of the needle. Vodka is basically just alcohol and water, so it won’t impart an unusual taste in the process. The next step is to sterilize the cork. 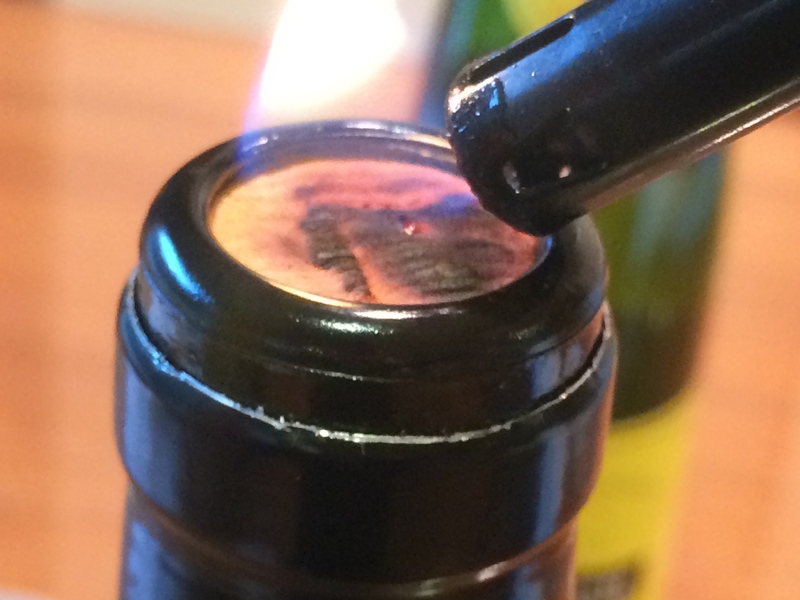 To do this, I lightly char the cork with a lighter and then wipe it down with some vodka. It’s not an exact science and may leave some stalwart germs behind, but it’s as good as I can get. 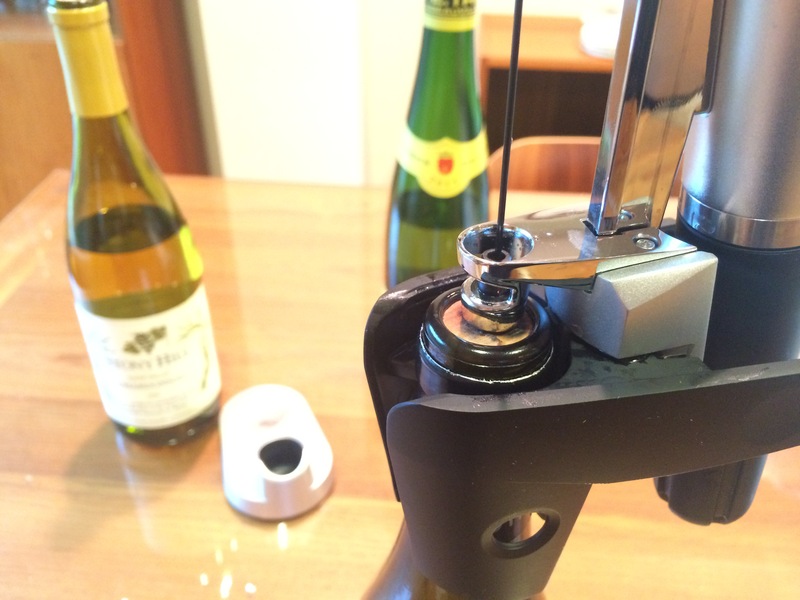 The next step is to open the lower jaws of the Coravin and rest the silver needle guide directly on top of the cork. The needle isn’t perfectly centered (nor can it be– wine bottles vary slightly in diameter as different makers use different thicknesses of glass in their bottles). Thus, it isn’t very likely that you will be going through the same hole each time you access the wine. Once the bottle is positioned, you just push the head of the unit down. The needle moves extremely smoothly– no doubt because of the teflon coating the needle. In one easy movement, it smoothly penetrates the cork completely. As soon as I do this, there is a slight release of gas– a little bit of the positive pressure I imparted the last time I accessed the wine and a sure sign that nothing nasty has gotten into the bottle. Next, I tilt the bottle (with Coravin attached) over a two-ounce shot glass and gently pulse the silver trigger at the top of the unit. This injects some pure argon into the bottle, which creates a positive pressure on the inside of the bottle. 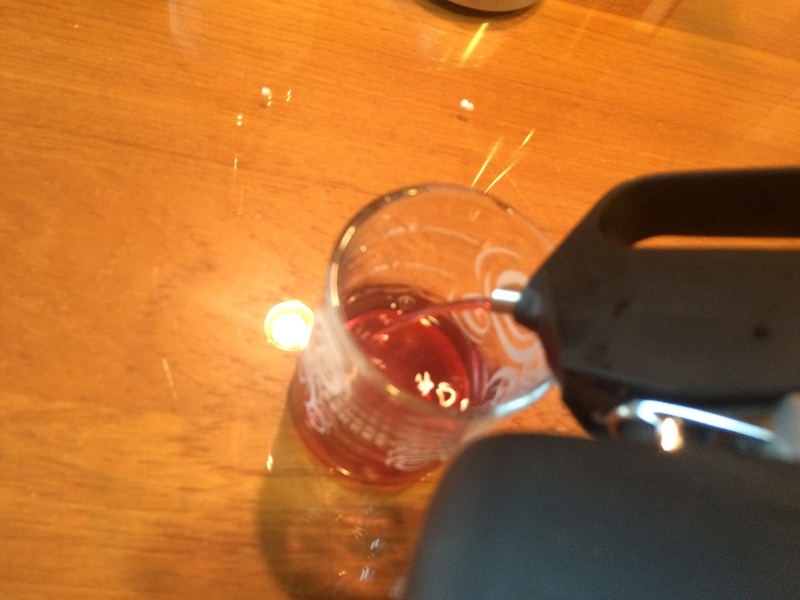 When I release the trigger, a small trickle of wine comes flowing out of the Coravin’s spout. The wine doesn’t gush out as when you are pouring from a bottle, but it’s fast enough. As soon as you release the trigger, the pressure is quite high inside the bottle and the flow rate will be higher. As more wine comes out, the pressure inside the bottle starts to be relieved and the rate of wine flow starts to slow down. As I get near two ounces or so, I start pulling the head unit away from the bottle. This causes the flow of wine to stop because the needle tip is now in the middle of the cork instead of the inside the head space within the bottle. I then tip the bottle up, wait a few seconds, and then pull the head unit upwards, fully extracting the needle from the cork. This leaves a fair amount of pressure in the bottle, which will be evident from a slight hissing (and possibly some bubbling wine) at the top of the cork. In a few moments, this stops as the pressure differential is no longer high enough to overcome the sealing action of the cork. Note that everything in this paragraph differs from the instructions that come with the Coravin– they recommend tipping the bottle up when the wine is still flowing– causing a hiss of pressure. While this technique works fine, it doesn’t maintain the positive pressure inside the bottle that I think helps ensure that nasty stuff doesn’t end up inside the bottle. The next step is to hit the cork one more time with the lighter to help sterilize it. Again, while not necessary, I’m a belts and suspenders kind of person when it comes to wine preservation. 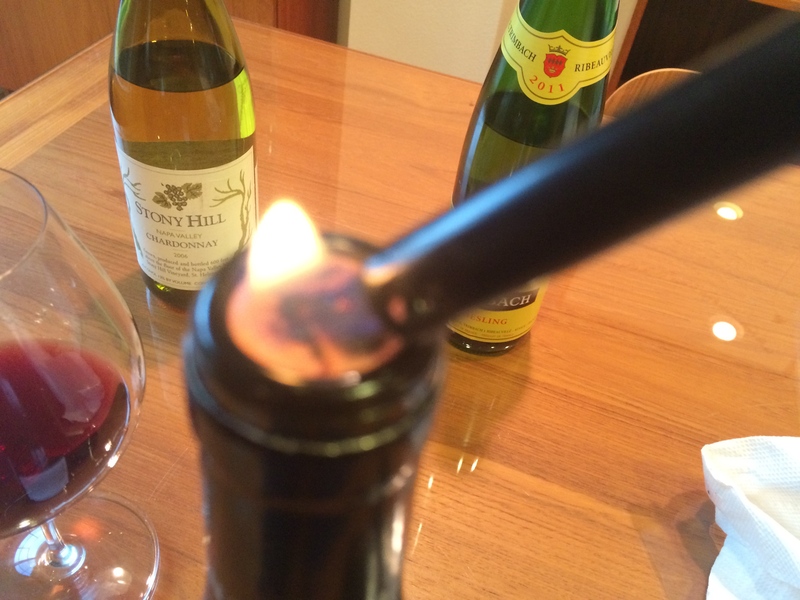 The Coravin people don’t mention sterilizing the unit with vodka or flaming the cork. I don’t know if it makes any difference at all, but it can’t hurt. Once I’m done for the evening, I run a few drops of water and then vodka through the spout (so it comes dripping out of the bottle of the needle) and I also wipe down the outside of the needle with vodka again. The last step, of course, is enjoying an amazing glass of wine– all without the guilt of wasting either your hard-earned training or a well-deserved great bottle of wine! I’m not a professional wine critic so my opinion isn’t worth that much. However, two of the most influential wine critics in the world (none other than Robert Parker and Jancis Robinson) both found no discernible difference several months after first accessing the wine. Jancis Robinson lamented the loss of romanticism associated with opening bottle(s) of wine and watching them open over the course of an evening. My feeling is that that’s always an option, but not for every night and certainly not during heavy training. On the other hand, some of the best restaurants are now greatly expanding (and improving) their wine-by-the-glass program thanks to the Coravin. At $300, a Coravin is not an obvious investment unless you really love wine. But if you would like to have a decent bottle of wine that costs north of $20 a bottle and want to be able to train effectively, it quickly pays for itself. The only other real costs are the argon cylinders, which cost about $10 and are good for about 15 five-ounce glasses of wine.